On any regular day, you may not accumulate enough waste to rent a dumpster. However, there are many occasions when a dumpster rental can come to your rescue. If you are undertaking large home cleaning or improvement project, you may need temporary arrangements to store wood waste and other trash items until you can dispose it off safely. Here are some of the top reasons when renting a dumpster is a smart and economical idea. One of the most common reasons homeowners seek rental dumpsters is when they are reconstructing, renovating or improving their property. Owing to the large amounts of wood waste, plywood and additional construction taking up space in your property, it is important to setup a separate bin to collect this additional waste. Construction, whether small or major, leaves behind a lot of debris and waste items that are otherwise a nuisance to handle. A large dumpster rented from a local company can hold this waste until you send it for proper disposal. If you feel like you have hoarded too many items over time, renting a dumpster can be a quick and easy way to manage waste. Regular cleaning of your house is a good way to ensure that waste is disposed off regularly. Whether you are indulging in spring cleaning or for the holiday season, a rented dumpster that accommodates all your unnecessary belongings is a convenient option. After you have de-cluttered your home and cleared the garbage, you can make arrangements to have them recycled or disposed off in a responsible and eco-friendly manner. Advanced yard work like landscaping and patio construction tends to create a lot of waste like dirt, mud, waste construction materials and other garbage. Whether you are engaging in trimming trees, planting new crops or setting up new furniture in the lawn, a large dumpster can help you prevent multiple trips to the local landfill and size it down to one. If you are moving to a different neighborhood or even city, it is important to segregate your belongings. It is obvious that you will not take every thing from your current home to your new one. To keep luggage to a minimum, you can start by disposing unnecessary items that you may have accumulated over the years. On the other hand, if you are downsizing, renting a dumpster can be a good idea for waste disposal. These rental dumpsters can also be useful if you have seen a death in the family and want to dispose their extra belongings. If you are hosting a large scale event like a wedding, party, carnival or any social setting with a significant number of attendees, proper waste disposal becomes important. If you do not own any large sized dumpsters, renting them for a short period of time can be an economical option. With proper trash collection, storage and disposal, you can handle any event without hassles and ensure that garbage is not a problem. Watch our bin rental dumpster service in Vancouver Video. 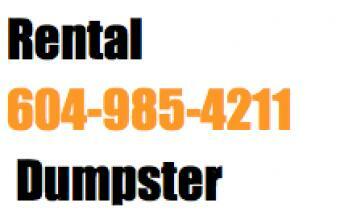 Watch our rental dumpster service in Vancouver.